Programmatic is the fastest growing segment of the U.S. digital display advertising marketplace, and is projected to expand 26.3% to $46.55 billion, according to updated estimates released by eMarketer on the eve of Advertising Week in New York City this week. That’s a slightly faster rate of expansion than the overall digital display market, which eMarketer projects will grow 25.4% to $57.42 billion. The only digital segment growing faster this year, is essentially a form of programmatic advertising -- search -- which will expand 27.7% to $48.49 billion. As part of the update, eMarketer also released new long-term projections for the major digital marketplace players, which shows Amazon continuing to gain market share. 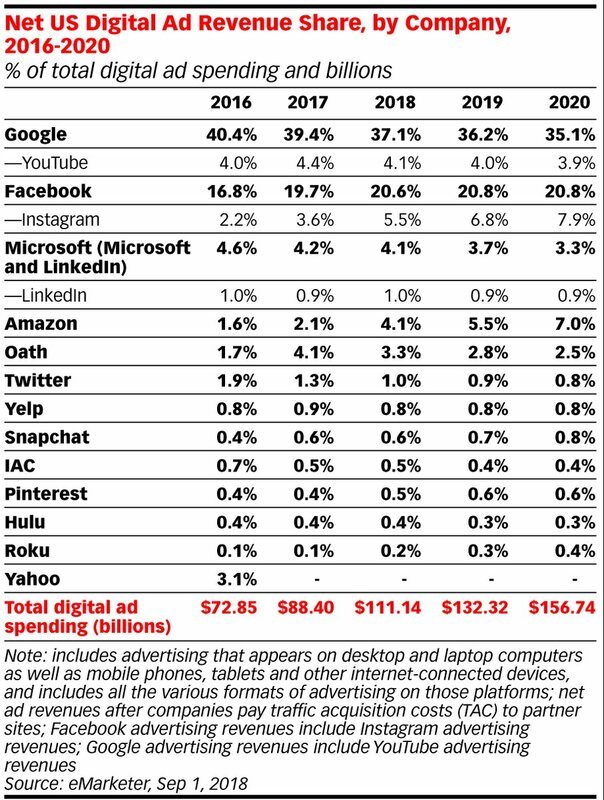 eMarketer, which last month estimated Amazon will overtake Microsoft as the third biggest digital advertising platform after Google and Facebook will also cut into Google’s market share over the next two years, to capture a 7.0% share of digital advertising in 2020. While Google will remain the overall market leader, Amazon also has, or is on the verge of supplanting Google’s YouTube division.